Stuart Horten - ten years old and small for his age - moves to the dreary town of Beeton, far away from all his friends. And then he meets his new next-door neighbours, the unbearable Kingley triplets, and things get even worse. But in Beeton begins the strangest adventure of Stuart's life as he is swept up in quest to find his great-uncle's lost workshop - a workshop stuffed with trickery and magic. There are clues to follow and puzzles to solve, but what starts as fun ends up as danger, and Stuart begins to realize that he can't finish the task by himself . . . 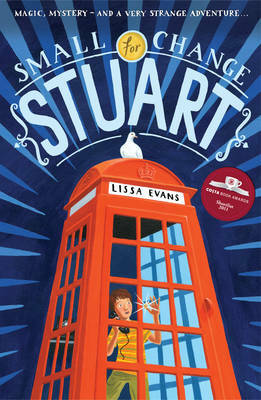 The first children's novel by Lissa Evans, this is a fast-moving blend of comedy and magic. Author Lissa Evans originally trained as a doctor before moving to work in radio and television production where she won a BAFTA for her work on Father Ted. She published her first book, Spencer’s List in 2002 and her other works include Crooked Heart, the CILIP Carnegie Medal and Costa Award-shortlisted children’s novel Wed Wabbit and Their Finest Hour and a Half – adapted for film as Their Finest in 2017.